C-SD starter Logan Middleton fires as Kent County's Noah Iseman dashes for second, during Wednesday afternoon's game in Cambridge. Middleton had a career-high 10 strikeouts in five innings as his team's starter. The Vikings won, 10-8. C-SD's Noah Presley drives a ball deep to left field for a fourth-inning triple on April 10, 2019, against Kent County. Cambridge-South Dorchester’s Noah Presley dives into third base with a fourth-inning triple Wednesday afternoon against Kent County, as infielder Dean Sipe (left) leaps for the relay throw, and Viking head coach Chad Wolfe tries to wave Presley home. C-SD sophomore right-hander John Henry picked up his second win of the year, pitching a scoreless inning of relief Wednesday, as the Vikings defeated visiting Kent County, 10-8. C-SD's Khalik Beasley went 4 for 4 with two doubles and three runs scored Wednesday, scoring the go-ahead run as well, in his team's 10-8 defeat of Kent County. CAMBRIDGE — The late A. Bartlett Giamatti said it best when he declared baseball was designed to break one’s heart. Wednesday at Cambridge-South Dorchester High, the Trojans suffered another heartbreaker, losing for the third time in a week thanks to an opponent’s rally in its last at-bat. The Vikings scored two runs in the bottom of the sixth to break an 8-8 tie and earn a crucial 10-8 victory in the North Bayside standings, while also avenging an early season loss at Kent County. Cambridge-SD improved to 4-5 overall, 1-1 North despite committing seven errors. All eight Trojan runs were unearned. The Trojans (4-5, 0-2) started fast, capitalizing on errors and solid hitting. In the top of the first, Noah Iseman’s two-out single began a rally which eventually led to a 3-0 lead. RBI singles by Kenny Fowler and Dean Sipe powered that spurt, the inning kept alive in part by two errors on the left side of the Viking infield. The Trojans extended their lead in the second. Gary Emory’s ground ball to third was mishandled to start the inning. Two batters later, Peyton Taylor (two runs) singled him home to make it 4-0. Taylor then stole second, and scored on Iseman’s single. Jay Duey’s single started a Viking rally in the second. John Henry’s RBI single and Dylan Meekins’ two-run single made it 5-3. Logan Middleton beat out an infield single to lead off the C-SD third. Khalik Beasley (three runs, 4 for 4) followed with a hard-hit ball to the right side — which struck Middleton as he ran toward second base. The play, officially a hit, was also an out, retiring Middleton and putting Beasley on first. Noah Presley singled and Duey walked to load the bases. Tommy Crain’s grounder to short was misplayed, allowing Beasley to score and keeping the bases loaded. One out later, Henry’s two-run single made it 6-5, scoring Dazheem Emory, who courtesy-ran for Presley, and Duey. The Trojans answered in the top of the fourth, scoring two more unearned runs against C-SD junior right-hander Middleton. A two-base throwing error put leadoff man Ian Walters on second. Taylor singled him to third, and made second when the throw home sailed over the cutoff man. Iseman followed with his third hit, scoring Walters to tie things up. A delayed-steal play allowed Taylor to swipe home plate a moment later, making it 7-6 Kent. C-SD again tied the game in the bottom of the inning. With two outs, Beasley hit his second double. Presley tripled to right, scoring Beasley. Emory came in to run, but was stranded when Trojan starter Buddy Welch got Duey to fly out to center. C-SD regained the lead in the bottom of the fifth when Eric Willey reached on a fielder’s choice and scored Shamar Young’s single to right for an 8-7 lead. Walters led Kent’s sixth with a fly ball to right that was dropped for a three-base error. The miscue came on starter Middleton’s 105th and rules-mandated final pitch, and Wolfe brought Henry in from left field to pitch. The next ball hit into play, off Taylor’s bat, was thrown away by Young, playing shortstop, and Walters scored to make it 8-8. Beasley led off the home sixth with a single to right-center field. He stole second as Duey batted one out later. On a 3-0 offering, Beasley broke for third, but Duey fouled off reliever Collin Turner’s pitch. Wolfe, coaching third, called for the steal again at 3-1. It paid a huge dividend. The pitch went high for ball-four, and Beasley slid in safely at third. The throw from the plate to catch Beasley got away from Sipe at third base, rolling up the left field line. Beasley scored on the error, and Duey advanced to second. He scored a moment later on Crain’s single up the middle for a 10-8 lead. Kent County putting two men in scoring position in the top of the seventh after a one-out double by Wayne Morris against Presley, who caught the first six innings before taking the bump. But Presley got a strikeout and a game-ending pop-out in foul ground. Presley earned the save by pitching a scoreless seventh. The relief victory upped Henry’s mark to 2-0. He picked up another victory of sorts after the game when his girlfriend, Kathryn Collison, asked him to the prom after the game and he accepted. The Vikings host the Colonels today at 4 p.m., and Saints Peter and Paul on Friday. Notes: Despite a career-high 10 strikeouts and not allowing an earned run, Middleton, who pitched into the sixth inning, got a no-decision due to eight unearned runs. ... Kent County is 1-3 in one-run games, the lone win coming at home against Washington, by a score of 8-7, on March 27. The Trojans lost 6-5 at Snow Hill on April 4, giving up two in the bottom of the seventh. Monday at Easton, they led 13-9 in the bottom of the seventh before five runs gave the Warriors a 14-13 win. 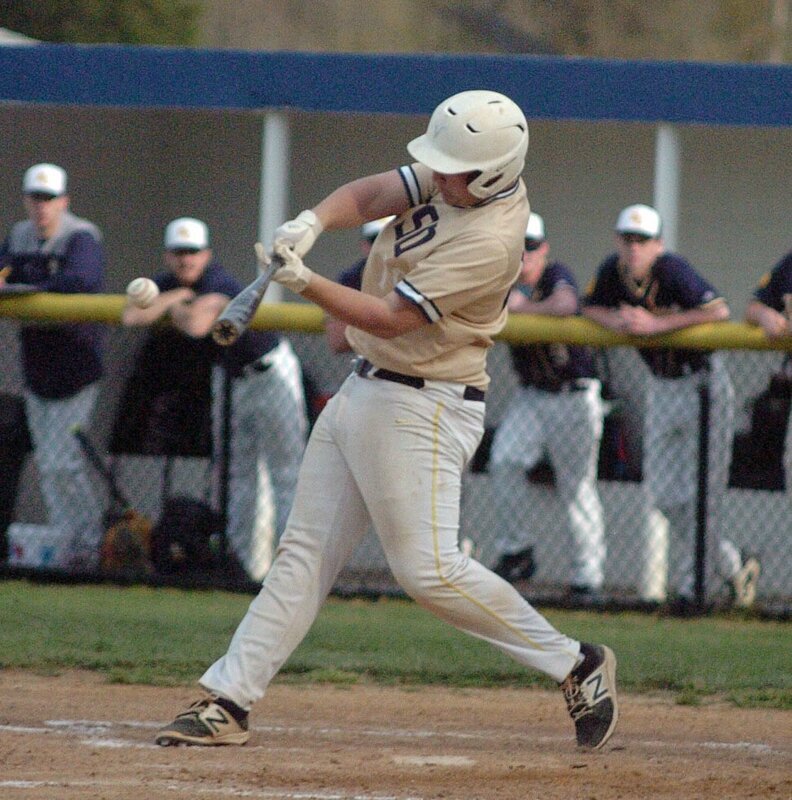 TOWSON — Connor Quade’s solo home run provided the only run for the Sabres, who fell in five innings. Monday, however, Sts. Peter & Paul rolled over Chapelgate Christian, 11-1, fueled by a Shawn Reinoehl two-hit complete game. In that victory, Hunter Hoffman homered, tripled, and drove in five runs, and Aubrey Perry collected three hits. The Sabres are now 5-3 overall, 4-3 Maryland Interscholastic Athletic Association C Conference. Follow me on Twitter: @SDBaysideSports.